This book was another library find of mine. It's one of those large, non-fiction books you find on its own little stand because it looks new and colourful. I came for a few 'recommended' books such as the Dunbar guides and having spotted it on my way out, grabbed it also. I was attracted by the modern cover design and easy-to-read typesetting, but it turned out to have a really practical, sensible approach to having a dog in the city. In fact, I feel it provides a practical, sensible approach to having a dog in general. This Hamlyn (UK) book may not have had us 'down under' in mind, but Australia is one of the world's most urbanised countries. We also have one of the world's highest rates of pet ownership. So it's not surprising that I feel this book is practically a must-read for a new dog owner. And I think this book provides us with just that -- a little understanding, training and care -- so that we can, in turn, provide our dogs with the same. 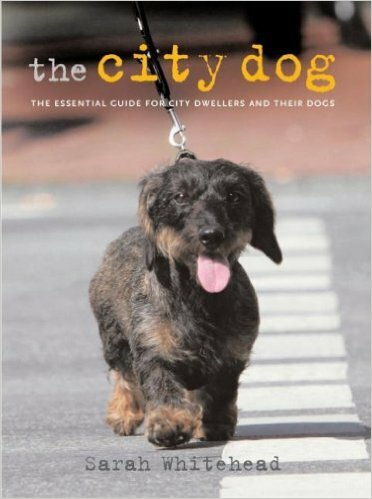 It presents a thorough understanding of the issues involved in having a city dog, from sheer size considerations for a dog navigating city streets to the necessity of 'leave it' in that environment. Each double-page spread has eye-catching (and adorable!) photos alongside descriptions which provide an understanding of the relevant concepts without descending into jargon. And the training exercises? Recall, Sit, Down, Leave it -- as well as attention, socialisation (with checklists!) and café manners -- are what I'd consider essential for any pet dog anyway, so I love that they are all there, with step-by-step photos. And I think reminding owners about balancing their needs with that of their dogs -- such as bringing the dog along to the outdoor mall for a shopping spree but taking care pup doesn't leave hairs on the clothing -- shows that they really have covered the topic 'with care' and consideration. Ditto, Kirsten. And I'm finding extensive reading really is helping - I don't have an lot of dog experience, so I'm reading as much as I can and trying to apply it as much as I can, and I'm finding some of the things people tell me at at the dog park don't make sense... while following discerning reading and my own mind is working for me. Would love to hear what helps you with Marshal. And hehe, very glad to hear it's helping you sleep!